How long does it take to change your life? Follow author Robert Fure as he begins a 100 day trek to a fitter, healthier life by following this simple program. 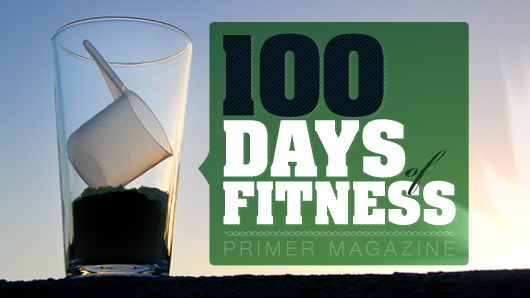 Today, we talk about food and nutrition on the 100 Days of Fitness program. So. Eating. It's very important. To life and health. There is no doubt about that. It's also pretty fun. Who doesn't enjoy eating pizza or burgers or having some candy? It tastes good. Unfortunately, too much of a good thing can do some pretty horrible things to our bodies. Too many muffins and we get muffin tops. Not a good look on anyone, I'm afraid. The science behind nutrition is tricky, but only because we hit a bump in the road about forty years ago and ended up in a strange place. Obesity, and plenty of other ailments, are referred to as the “diseases of civilization.” They're not present in tribal people and they weren't very common throughout history. Something changed in either the way we ate or the way we acted. The two opposing camps on this came up with two completely different ideas. One side, the side you're familiar with, says that we became lazy and started eating more fat. The other side said forget all that, we never ate processed carbohydrates and sugar before. It's interesting to note that this schism came recently. In the past there was only one side – sugars and breads made you fat. As we started eating more sugars and more breads, it became harder and harder to blame them for our problems when they were a staple of our diet. Fat became the new enemy because hey “fat makes you fat” just sounds correct. But that's like saying eating fish makes you fishy or eating paste makes your blood sticky. I've taken the time to read up on the subject, most notably using Gary Taubes's Good Calories, Bad Calories, and it made sense to me. The science behind it seemed to make more sense than the science behind the “fat is bad” science. Our own Josef Brandenberg interviewed Gary Taubes, so if you don't feel like reading through his 500 page textbook on calories, you can read this interview and see where I'm coming from. If you're not sold, check out my results below. So, to paraphrase nutrition on this plan. Low carbs. Personally, I'm avoiding bread, cereals, sugar, and even most fruits except on cheat days. Now, fruit won't make you fat, but it does have a lot of sugary carbs. A banana or apple here and there won't ruin your day. Josef Brandenberg also composed a pretty good list in terms of what carbs you should eat and which you should avoid. Here's the list and I agree with it pretty completely. What does this leave for you to eat? Meat and vegetables. A very traditional diet that was common from the days of clubbing gophers in the wild right into the 1800s. One easy way to think about “Can I eat this” is to ask yourself “Can I get my hands on this in the wild?” You'll never find a loaf of bread or a bowl of cereal or a Snickers. You will find plants (vegetables and fruit) and meat (animals). The closer to wild the better – lunch meats get processed and some even have sugars and all sorts of nasty science added to them. But steak, hamburger, chicken, turkey, all of that is good stuff. Eggs are a great option. Any sort of green vegetable is awesome. Potatoes and corn are a bit starchy and are the exception to the rule. Now, there are some things you can't find in nature, but are still okay in my book. Some milk and cheese in moderation and whey protein. Whey protein is great because it's low in carbs, high in protein, low in calories, and fills you up. Grated (and dried) Parmesan cheese is a great way to add flavor to a dish with only twenty calories per serving and no carbs. Hot sauce will be your friend when your meals get boring – though there is no need for your meal to get boring. If we're avoiding carbs, and we agree with the science, we see that fats – such as butter – aren't bad for us. So you can have very flavorful meals without carbs. All of this said, we can't pig out. We are trying to lose weight. You can calculate your Basal Metabolic Rate (BMR) using a calculator like this one and that will tell you how many calories your body needs to maintain weight. You should aim to eat fewer calories than that, but a lot of studies show that you don't have to restrict calories as much if you're avoiding carbohydrates. Remember – Eat Smart. If you've got thirty pounds to lose, a man should be fine eating 2,000 calories a day and a woman should be fine eating 1700 calories a day. When eating meats and vegetables, you'll notice that you can eat a lot of volume without eating too many calories. In any restricted diet scenario, I do recommend taking a multi-vitamin daily. We'll talk more about supplements later in the program, but at the very beginning all you really need is the vitamins. So as you can see, nutrition here is simple. Avoid refined carbohydrates. Eat plenty of vegetables and meats. Drink plenty of water to keep your body hydrated. My starting weight was 251.5 pounds measured Monday morning. On Saturday morning my weight was 248 pounds. Down 3.5lbs in basically five days. Not a bad start. I worked out for about an hour a day Monday-Friday. Next week we'll talk more about the exercise side of things. What does your calendar look like? Other than some mashed potatoes at a family dinner, mine was a pretty solid week. Robert I’m glad you’re doing this. Best of luck! I was 80 lbs overweight at one point, and lost it all with a low carb, high protein diet, and a ton of exercise. It’s all about moderation, keeping active, and perseverance. Can’t wait to see your results. .-= Barron´s last blog ..The Endorsement: The Chambray Shirt =-. Thanks for the well wishes. Good to hear you’re already on the health wagon, congrats on losing 80lbs. So far I’ve been focusing more on diet than exercise, though as you’ll see in upcoming articles, I’m about to ramp up the exercise. Thanks again! I agree totally on the low carbs. I always used to think that a low fat diet was the way, but even with a lot of commitment to dieting still found extra weight on my stomach. It was only about 12 months ago when I changed this dieting plan up after hearing about it from Tim Ferriss on the 4 hour work week. I ended up eating more (and being more satisfied) from focusing on high protien, low carbs and not being concerned with fat, but still lost approx 20 pounds in the 6 month period, with not much extra effort. One question however is at what pioint does a day become a write-off? You see my target isn’t to lose a lot of weight, it’s more to improve my diet to compliment the exercise that I’m already doing. So for, example, I added new potatoes to my mackerel salad today – does that write the whole day off? I know that’s an extreme example, but is it such a fine line or is there more of a grey area? You’re sort of on your on recognizance on this plan. There is a good bit of grey. Theoretically you could eat some ice cream and still not have a bad day. Now, if you have a double fudge cupcake Sunday, regardless of your other calories, that’s probably a day you’re not going to count. Eating some potatoes (or other carbs) every now and then isn’t going to hurt. You want to keep your carbs low in general and make sure you caloric balance favors protein and fats over carbs. So if you eat 2000 calories, as long as most come from protein and fats, you’re in the right area. You can judge your success by your weight loss or the way your pants fit or this or that. If, at the end of the week, you’re not getting results, you know you’ve made some mistakes you may not have counted. Cheers Robert – I certainly had a weekend I could write off…but then again it was my brother’s 21st. I can make allowances like that! Excellent topics, I really like this topics. After long searching I found this online that the best chiropractic clinic helps people in Lawrenceville GA with back pain, neck pain, headaches. Call their office and speak to any one of their friendly staff to make an appointment for a FREE consultation.